Important for travellers in Germany! For several years, regulations have been in force in Germany concerning the harmful emissions from motor vehicles. 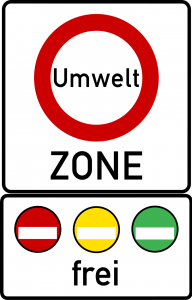 In most German cities and provinces, the so-called ‘Green Zones’ have been created and their crossing is legally permitted only for vehicles with a sticker corresponding to their environmental category. Green Zones are located mainly in the central parts of cities, as well as in industrial areas and areas with increased levels of dust and air pollution. This includes ring roads and suburban terrains. The restriction is applied for buses and freight vehicles, as well as for passenger and goods motor vehicles of categories M1 and N1. There are no restrictions for travelling of two- or three-wheeled vehicles, industrial trucks, agricultural tractors, mobile machinery and equipment, retro cars, vehicles of disabled persons and special purpose vehicles. The rules apply to all vehicles with German and foreign registration plates, including Bulgarian! The zones are marked with the following signs. The passage of motor vehicles through these zones is not permitted. An exclusion from the general restriction is indicated by an additional sign. Vehicles may cross the Green Zones if they have a sticker attached to the windscreen corresponding to the additional sign. The sign shows the colour / colours of Eco-Stickers that allow entrance of the vehicle in the particular Green Zone. How to buy your Eco-Sticker for access to Green Zones in Germany? 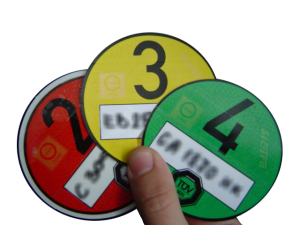 In its capacity of partner of TÜV SÜD, TECHNOTEST JSC issues Eco-Stickers for Germany without prior request – on spot, at the office of TECHNOTEST JSC in Sofia, without the need for a physical inspection of the motor vehicle, or by courier. The validity period of the stickers is indefinite. The sticker should be renewed when changing the windscreen and/or re-registering the vehicle. Once issued and adhered, the Eco-Sticker is valid for crossing all Eco Zones in Germany where the eco-class in question is allowed.